Modern air conditioning systems get more sophisticated every year, as manufacturers strive for more efficient equipment. These changes not only help the business owner save on utility bills, but also help to reduce the business’s carbon footprint — a factor that will be increasingly important in the future. But the downside of the technological advances that are improving the performance of modern air conditioning systems is that they require more training to install, maintain, and repair. 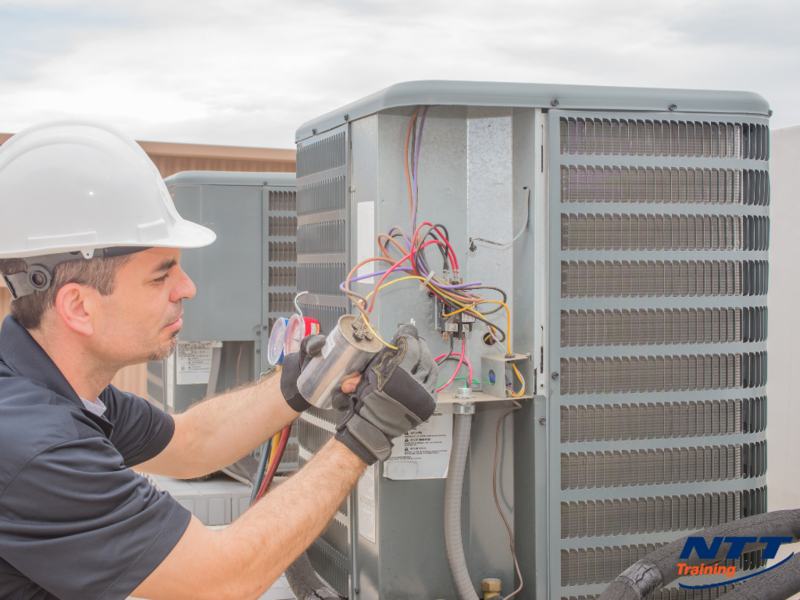 If you expect to keep employees on staff who are capable of working on the company’s A/C system, they will of course need basic training in the fundamentals of HVAC (heating, ventilation and air conditioning). This is usually obtained in an apprenticeship or a training course at a community or vocational college. After the initial training, various certifications will be available as employees progress in their profession, such as the NATE (North American Technician Excellence) certification and the HVAC Excellence certification. But what about more advanced training? At some point you may want your employees to do more than change filters, clean coils, or charge refrigerant. Maybe your operation would find it helpful to have a top technician on board, so you’re willing to sponsor the training necessary to take this individual to the next level. Let’s look at what the technician will likely learn. To become a proficient HVAC technician, the student will need to know a little bit about everything — principles of refrigeration, engineering, electricity, chemistry and physics, as well as a bit of math and mechanics. Put all this knowledge together, and you’ve got someone who can successfully troubleshoot an air conditioning system. For instance, physics. The basic principle behind HVAC is thermodynamics, or the study of work, heat, and physics on a system. In air conditioning, the student will be concerned with the movement of heat within a system — principally as heat is absorbed by refrigerant within a structure, then moved along by the refrigerant to the outdoors, where the heat is exhausted, with the system repeating the process by pumping cooled refrigerant back into the interior of the structure. This process is known as the vapor-compression refrigeration cycle. Refrigeration has already been mentioned. It is the lifeblood of the air conditioning system, and a substance that is hazardous to handle, both to the user and to the environment. Anyone who handles refrigerant is required by law to be licensed. And while it might seem as if recharging a system with refrigerant is easy enough, the technician will also need to be able to find out why an A/C is losing refrigerant. Further, the once commonly used R-22, no longer on the market due to the harm it caused the ozone, is in dwindling supply; over time, the equipment that was designed to run on R-22 will also be phased out and replaced by equipment that uses the newer refrigerants. Today’s technicians must be well versed in what types of refrigerants can be used in the company’s equipment, whether new or old. The technician may also need the expertise to evaluate whether it’s time to upgrade to new HVAC equipment that can work with the newer refrigerants. The HVAC trainee will also need to know something about psychrometrics, or the field of engineering that pertains to the thermodynamic and physical properties of gas-vapor mixtures. HVAC technicians should be able to read psychrometric charts to understand changes in water vapor in air, or rather the amount of water vapor that air can hold in suspension depending on the temperature and pressure of the air. Other topics that might come under the psychrometric heading are moisture control, humidity, preservation, and dew point. An advanced technician should be familiar with the components of refrigerant equipment, which would include evaporators, condensers, compressors, metering devices, and refrigeration-system accessories. Advanced training might also encompass study of refrigerants and oils, including the new refrigerant R-410A, refrigerant composition and classifications, safety with handling refrigerants, and environmental refrigerant regulations. Other topics for advanced study might include calculating the heat load in a refrigeration system, general troubleshooting, and preventative maintenance Your technician should able able to develop a regular preventative maintenance regimen so that the system stays in good working order, with worn parts replaced as needed before breakdown occurs. The technician should also develop an understanding of the workings of different types of equipment, including chillers, boilers, and various heating systems. Are your Employees Ready for Advanced AC Training? Having a well-trained HVAC technician on your team can help extend the life of your equipment. NTT’s ADVANCED AC (Air Conditioning and Refrigeration) seminar will give your employees the training they need to get the job done. For more information connect with NTT today.